President Obama today announced that he is requesting a joint session of Congress to announce his “new” jobs plan for America. This planned speech is set for 8 PM on Wednesday, September 7, 2011 and conflicts with a previously scheduled Republican presidential debate. How convenient! It seems that the arrogance of this president knows no bounds. He actually believes that millions of Americans are waiting with bated breath for this new plan, and its importance is of such a magnitude that it deserves a speech before a joint session of Congress. There is little doubt that this plan, like the many plans he has previously proposed, will be little more than a regurgitation of more spending and tax proposals, which have already been rejected by the Congress. 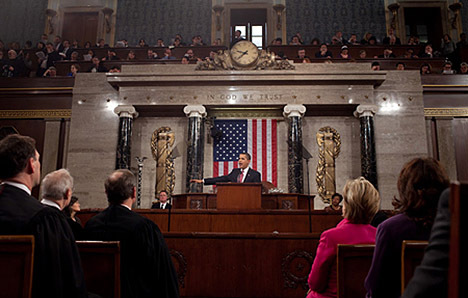 What this joint session speech is all about is Obama’s re-election to the presidency next year. His poll numbers are abysmal, so he and his campaign staff feel that he needs to do something bold to get his campaign moving again. This speech is nothing more than pure politics offered up as a legitimate effort to find a solution to the jobs problem in America today. The supreme irony of all of this is that this president has no idea of how America works or how to create jobs. He personally has no practical experience with the American economy, and the bulk of his advisors are university professors with similar backgrounds. He really is arrogant enough to believe that he can actually create jobs for Americans, when in fact all he can really do as President is destroy jobs. There are a number of real acts he could perform to reduce the damage he is doing to America’s job creation picture, but it is very unlikely that he will do anything to change his current job killing policies. Constraining the Environmental Protection Agency (EPA) from continuing their job killing regulations by removing some of the MACT boiler, cement and utility regulations, among others. Constraining the National Labor Relations Board (NRLB) from telling private companies where they can and cannot build plants and transfer their operations. Repeal some of the ObamaCare restrictions against company grandfathered health care plans, which will cause steep penalties for many companies. Unfortunately, this is just another Obama stunt! Since the adoption of a concurrent resolution both chambers of Congress is a requirement, I strongly advise Speaker Boehner to call on his Republican majority to deny the president this request. As a political stunt, this request is tantamount to asking the Congress to give Obama some free campaigning time. Unfortunately, I doubt that Speaker Boehner has the political courage to take such a step, although as of this writing he has at least been willing to ask the president to move the speech to Thursday. Obama could just as easily ask the networks for time on whatever night he wanted, and get just as much of an audience for this speech as he would get for a joint session speech. If this speech is approved by Congress, and I were a Republican Congressman, I would not show up for this charade. As for me, not being a congressman, I plan on hosting a United States Senate candidate from Texas at my Republican Club here in Denton, TX while Obama is speaking. I suggest that others might be more enlightened by watching the Republican presidential debate taking place at the Ronald Reagan Library in Simi, California.